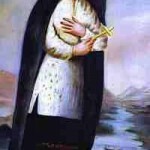 Kateri’s encounter with Father de Lamberville when she was 18. 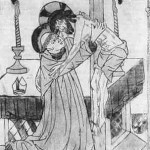 Her fervent conversion and her early baptism. After a year of desiring and striving to be given the opportunity for baptism in a chapel adorned with Elk skins and wildflowers out humble maiden receives the life giving waters of baptism surrounded by her kinsmen. The love and preparation of this Mohawk Maiden illustrates what a true desire for baptism looks like and her rapid growth in Grace is a shining example of fidelity. SN: In this chapter that the Priest gave his converts a rule of life to keep them from impure feasts, superstitions and drunken debaucheries; I think such a rule would be a good thing to copy and hand out today to our new converts. 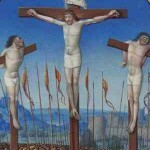 The Love Shown to us by Jesus Christ in his Passion: Part I God so loved men, that He gave His own Son to redeem them.